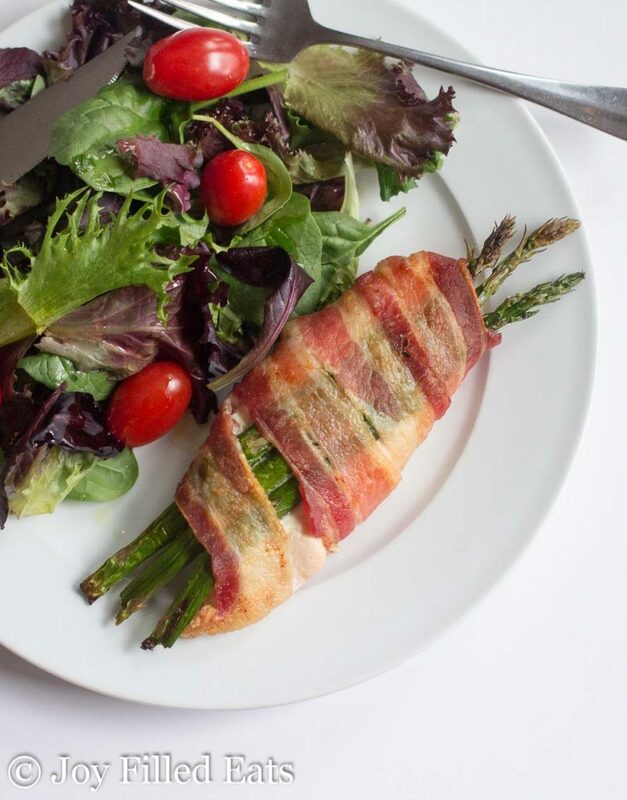 My Stuffed Chicken with Asparagus & Bacon has only 3 ingredients and a 5-minute preparation but it will impress your dinner company time after time. 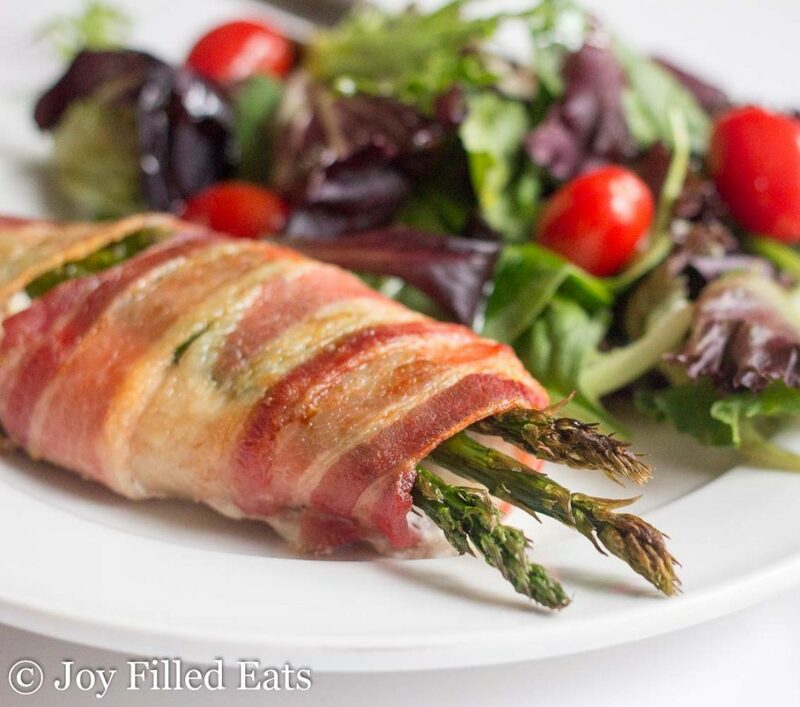 I love just about anything wrapped in bacon and this bacon wrapped asparagus chicken did not disappoint. My kids gobbled it up, asparagus and all. When I was in Costco yesterday I was staring at the chicken tenders and thinking about how using those to make a classic stuffed chicken would be so easy. Just add in a filling and wrap the whole thing in bacon to hold it together. Then there is no need to pound out the chicken or cut it. The tenders cook evenly, stay moist, and provide the perfect backdrop for almost any flavor. So, I came home, made this recipe, took photos, and started to type it out. And I discovered I’m not quite the genius I thought I was. 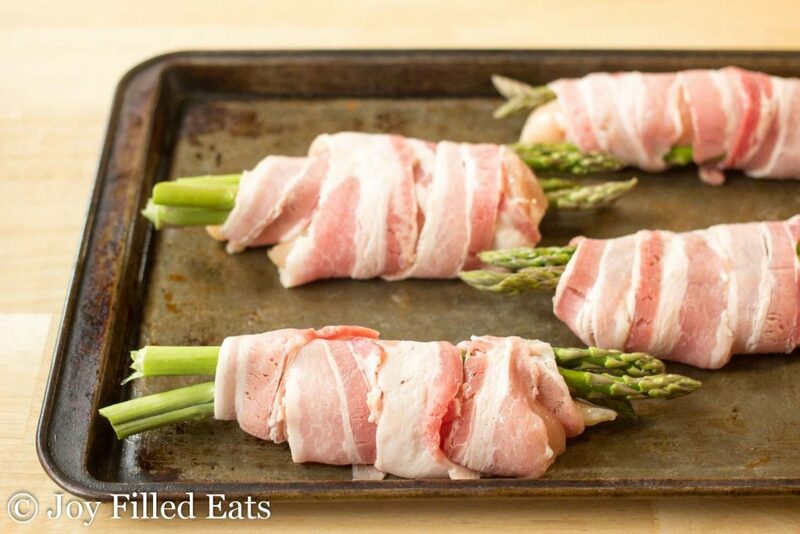 There are several bacon-wrapped chicken and asparagus recipes out there on google already. BUT I still think mine is the best because of the use of chicken tenders to cut down the prep work. I wrapped these up right on the baking sheet I was planning to cook them on. No extra dirty dishes for me. Having a family of 7 and an apartment size dishwasher means I try to keep the dishwashing to a minimum whenever possible. Whenever I make asparagus I snap the bottoms off as close to the end as I can. This leaves more delicious asparagus to enjoy then if I just cut off the bottom of all of them at once. 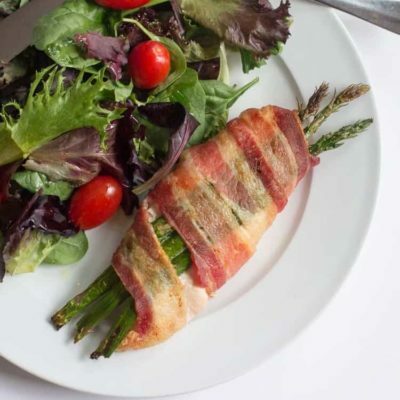 My suggestion is to serve this easy meal with some keto mashed cauliflower, a simple green salad, and low carb sangria. 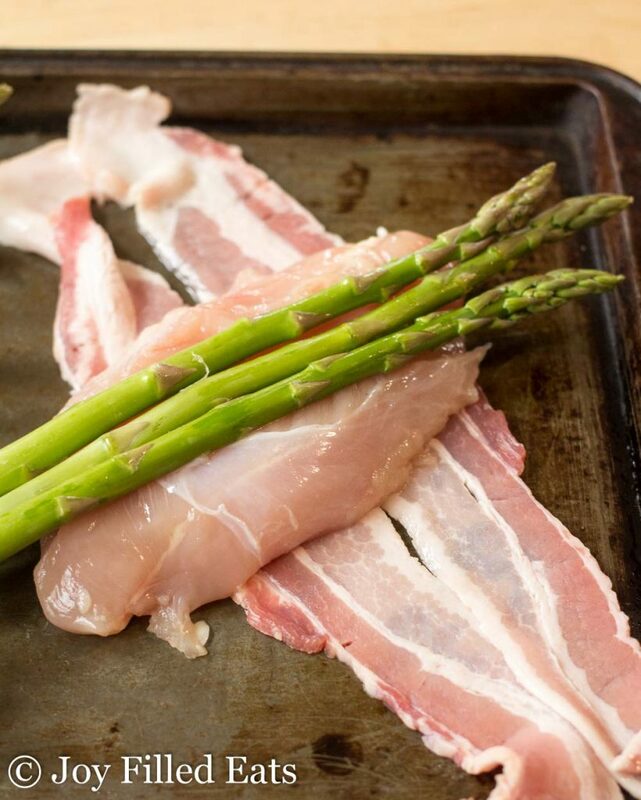 Lay two pieces of bacon out on a baking sheet. Place 2 chicken tenders on top. Season with a little salt and pepper. Add 3 spears of asparagus. 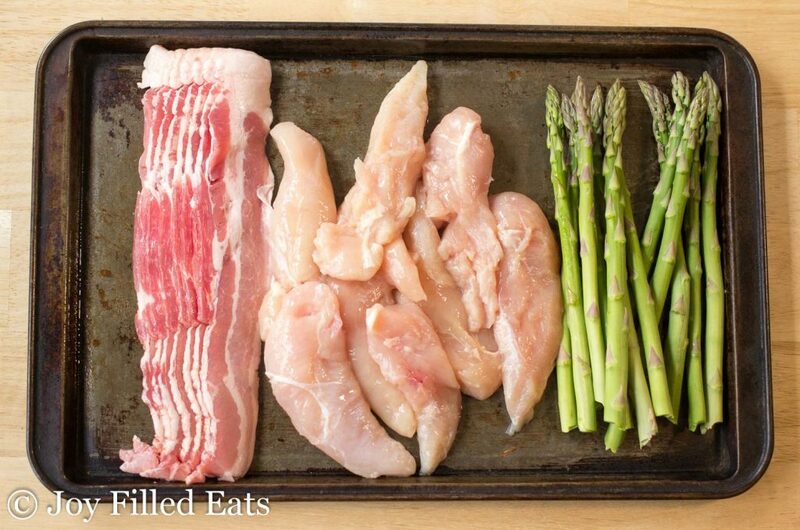 Wrap the bacon around the chicken and asparagus to hold it all together. Repeat. 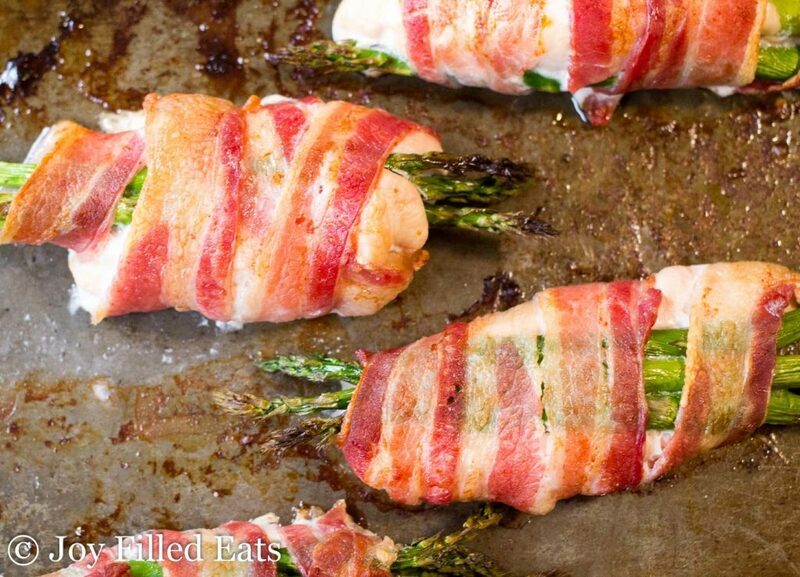 Bake for 40 minutes until the chicken is cooked through, the asparagus is tender, and the bacon is crisp. This is one of my absolute favorite recipes!! We make it a few times a month! Thank you! I noticed you do not have the amount per serving for any of your recipes. How can one know how many servings of each recipe you can have without going over your macros? The number of servings per recipe is at the top of every recipe card. The nutrition is always for one serving. My mistake I didn’t see the servings at the top. However I was referring to the amount per serving which is not listed on any of the recipes. How do you know how many ounces, cups, grams you may have when it isn’t listed? I'm sorry but I do not calculate that. I don't use macros myself but try to provide them as a courtesy to my readers. In any recipe, you can weigh the final product on a kitchen scale and divide by the servings listed. In most, you should be able to just eye it up. This calls for 8 chicken tenders which makes 4 pieces of stuffed chicken. 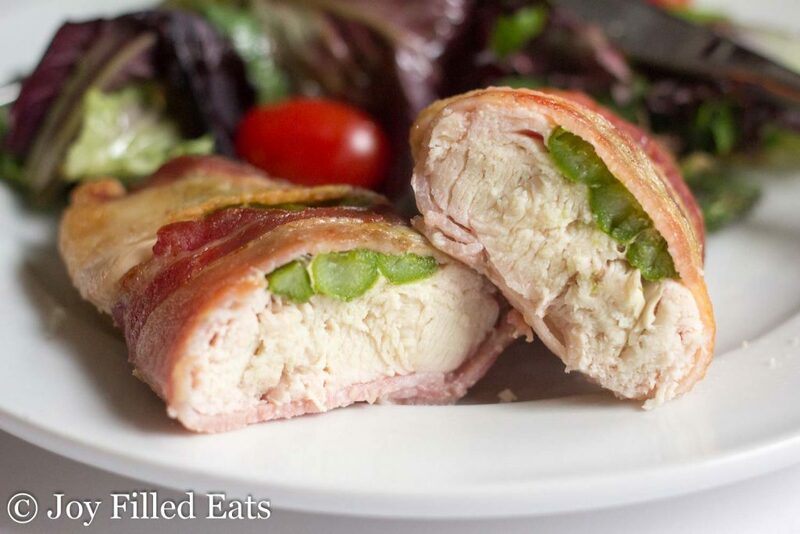 A serving is one piece of stuffed chicken. The green salad suggested in the description called simple green salad, link goes to a greek salad, not at all looking like the salad you have on the top pic of this dish. 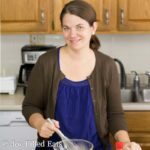 I am really new to this cooking healthy and especially this Keto diet. How do I make the salad that is pictured on top? Hi Jeff, the salad in the pictures is just spring mix (any grocery store sells it pre-mixed) with a few grape tomatoes. I just spritz it with olive oil and drizzle on a bit of vinegar. Sorry, there isn't a specific recipe.